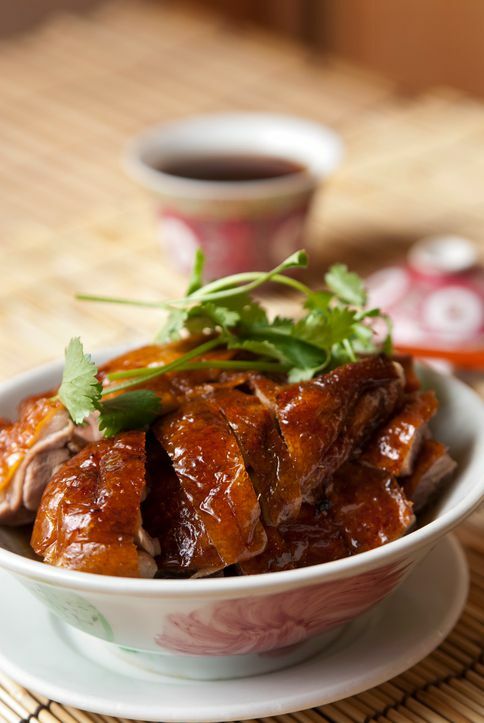 Cantonese roast duck is a great way to enjoy the tradition of roasted meats common in Hong Kong. You can serve roast duck with some stir-fried vegetables and cooked rice. Or, you can serve it Peking style with some Chinese pancakes, sliced or julienned spring onions, sliced cucumber, and hoisin sauce or sweet bean sauce. Cantonese people love all kinds of roast meats. In Cantonese restaurants in both the East and West you will see roasted duck, goose, chicken, and pork belly. You will need an empty wine bottle or similar bottle to help the duck stand up while you are preparing it with hot water and glaze before roasting. For the marinade, Shaoxing rice wine is preferred as it has a stronger flavor and is sweeter than Mijiu rice wine. Look for chenpi (dried tangerine peel) in an Asian specialty store. If you can't source it, you might substitute dried orange peel. In a large plastic bag, mix all of the marinade ingredients: ginger, garlic, green onion, salt, sugar, light soy sauce, dark soy sauce, rice wine, five-spice powder, and chenpi. Add the duck to the marinating bag and marinate overnight to 24 hours before cooking. When ready to cook, prepare the glaze. In a small saucepan, add the maltose, rice vinegar, and water. Bring it to a boil and ensure it's completely combined. Remove from the heat. In a pot, bring 2 to 3 quarts of water to a boil. This water will be poured on the raw duck to make the skin crispier. Stuff the duck with a wine bottle and place it in a clean sink. Take a ladle to scoop some boiled water and pour it on the duck. Make sure you pour the hot water onto every part of duck. Be very careful when you are doing this procedure so you don't scald yourself. After you have done this, leave the duck to dry. When the duck has dried, use a brush to brush the maltose and vinegar water on every inch of the duck skin and leave it to dry. Repeat this procedure three to four times. Place the duck on a roasting rack. Pierce the orange a few times then stuff it in the duck and roast the duck for 35 minutes. Then turn the oven temperature down to 355 F (180 C) and roast for another 20 minutes. Turn the duck around a few times for better results. Make sure you also baste the duck with the maltose water at least a couple times during cooking. Remove the duck from the oven and let it rest for 10 minutes. Place it on a chopping board and cut it into bite-sized pieces.